USES: Desmopressin is used to control the amount of urine your kidneys make. Normally, the amount of urine you make is controlled by a certain substance in the body called vasopressin. In people who have \"water diabetes\" (diabetes insipidus) or certain kinds of head injury or brain surgery, the body does not make enough vasopressin. 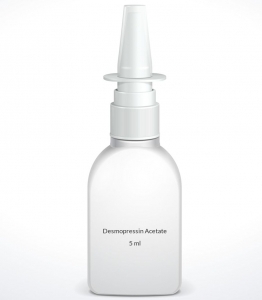 Desmopressin is a man-made form of vasopressin and is used to replace a low level of vasopressin. This medication helps to control increased thirst and too much urination due to these conditions, and helps prevent dehydration. Desmopressin products applied in the nose are no longer indicated to control nighttime bedwetting in children because of the increased risk of developing a serious side effect (a low level of sodium in the blood). HOW TO USE: Read the Patient Information Leaflet and instructions that come with this product before you start using desmopressin and each time you get a refill. If you have any questions, consult your doctor or pharmacist. Follow the instructions on how to properly prime the bottle if you are using it for the first time or if you have not used it for a week or more. Spray this medication in the nose, usually 1 to 3 times a day as directed by your doctor. If the dose is more than 1 spray, spray half the dose in each nostril. For example, if the dose is 2 sprays, give 1 spray in each nostril. Keep track of the number of sprays used from each container. Discard the container after you have used the number of sprays specified on the package. If a child is using this medication, a parent or other responsible adult should supervise and help the child use this medication properly. Limit drinking of water and other fluids while using this medication, especially in children and older adults. Consult your doctor for details. If you find that you are drinking more fluids than directed, tell your doctor right away. Your treatment will need to be adjusted. (See also Side Effects and Precautions sections.) Dosage is based on your medical condition and response to treatment. Do not use more desmopressin or use it more often than prescribed. Use this medication regularly to get the most benefit from it. To help you remember, use it at the same time(s) each day. Tell your doctor if your condition does not improve or if this medication stops working well. SIDE EFFECTS: Headache, runny/stuffy nose, nausea, upset stomach, or flushing of the face may occur. If any of these effects persist or worsen, tell your doctor or pharmacist promptly. Remember that your doctor has prescribed this medication because he or she has judged that the benefit to you is greater than the risk of side effects. Many people using this medication do not have serious side effects. Desmopressin can rarely cause a low level of sodium in the blood, which can be serious and possibly life-threatening. Drinking too much water or other fluids increases the risk of having a low level of sodium in the blood. Therefore, follow your doctor\'s directions for limiting fluids. Seek immediate medical attention if you have any of these unlikely but serious symptoms of a low level of sodium in the blood: loss of appetite, severe nausea, vomiting, severe headache, muscle weakness/spasms/cramps, sudden weight gain, unusual tiredness, unusual severe drowsiness, mental/mood changes (such as confusion, hallucinations, irritability), loss of consciousness, seizures, slow/shallow breathing. A very serious allergic reaction to this drug is rare. However, seek immediate medical attention if you notice any symptoms of a serious allergic reaction, including: rash, itching/swelling (especially of the face/tongue/throat), severe dizziness, trouble breathing. This is not a complete list of possible side effects. If you notice other effects not listed above, contact your doctor or pharmacist. In the US - Call your doctor for medical advice about side effects. You may report side effects to FDA at 1-800-FDA-1088 or at www.fda.gov/medwatch. In Canada - Call your doctor for medical advice about side effects. You may report side effects to Health Canada at 1-866-234-2345. PRECAUTIONS: Before using desmopressin, tell your doctor or pharmacist if you are allergic to it; or if you have any other allergies. This product may contain inactive ingredients, which can cause allergic reactions or other problems. Talk to your pharmacist for more details. This medication should not be used if you have certain medical conditions. Before using this medicine, consult your doctor or pharmacist if you have: kidney disease, a low level of sodium in the blood (current or past hyponatremia). Before using this medication, tell your doctor or pharmacist your medical history, especially of: high blood pressure, heart disease (such as blocked blood vessels in the heart), conditions that may increase your risk of fluid/mineral imbalance (such as cystic fibrosis, heart failure), the urge to drink too much water without being thirsty, bleeding/clotting problems. If you have lost too much body water (become dehydrated), your doctor will correct that condition first before starting treatment with desmopressin. Limit alcohol because it can interfere with how well desmopressin works. Changes inside the nose (such as scarring, swelling, congestion, or blockage) may affect how well desmopressin nasal spray is absorbed. Tell your doctor if you have any of these changes inside the nose because he or she may need to adjust your treatment. Tell the doctor right away if you develop any illness that can cause water/mineral imbalance (including fever, diarrhea, vomiting, infections such as the flu) or if you experience conditions that require drinking more fluids (for example, exposure to very hot weather, strenuous exercise, persistent sweating). The doctor may need to stop or adjust desmopressin treatment, especially in children and older adults. Children may be more sensitive to the side effects of this drug, especially water/mineral imbalance and a low level of sodium in the blood. Kidney function declines as you grow older. This medication is removed by the kidneys. Therefore, older adults may be at greater risk for water/mineral imbalance and a low level of sodium in the blood while using this drug. During pregnancy, this medication should be used only when clearly needed. Discuss the risks and benefits with your doctor. This medication passes into breast milk. Consult your doctor before breast-feeding. DRUG INTERACTIONS: Drug interactions may change how your medications work or increase your risk for serious side effects. This document does not contain all possible drug interactions. Keep a list of all the products you use (including prescription/nonprescription drugs and herbal products) and share it with your doctor and pharmacist. Do not start, stop, or change the dosage of any medicines without your doctor\'s approval. Other medications besides desmopressin may also affect the balance of water and sodium in your body. Therefore, tell your doctor or pharmacist about all the products you take, including: nonsteroidal anti-inflammatory drugs (NSAIDs such as ibuprofen, naproxen), psychiatric medicines (such as chlorpromazine), drugs to treat seizures (such as carbamazepine), SSRI antidepressants (such as sertraline), tolvaptan, tricyclic antidepressants (such as amitriptyline), \"water pills\" (diuretics such as furosemide). OVERDOSE: If overdose is suspected, contact a poison control center or emergency room right away. US residents can call their local poison control center at 1-800-222-1222. Canada residents can call a provincial poison control center. Symptoms of overdose may include: confusion, drowsiness, persistent/severe headache, sudden weight gain. NOTES: Do not share this medication with others. Laboratory and/or medical tests (such as urine tests, sodium blood level) may be performed periodically to monitor your progress or check for side effects. Consult your doctor for more details. MISSED DOSE: If you use 1 dose daily and miss a dose, use it as soon as you remember. If you do not remember until the next day, skip the missed dose and resume your usual dosing schedule. Do not double the dose to catch up. If you use more than 1 dose daily and miss a dose, use it as soon as you remember. If it is near the time of the next dose, skip the missed dose and resume your usual dosing schedule. Do not double the dose to catch up. STORAGE: Store at room temperature between 68-77 degrees F (20-25 degrees C) away from light and moisture. Keep the bottle upright. Do not store in the bathroom. Keep all medicines away from children and pets. Do not flush medications down the toilet or pour them into a drain unless instructed to do so. Properly discard this product when it is expired or no longer needed. Consult your pharmacist or local waste disposal company for more details about how to safely discard your product.